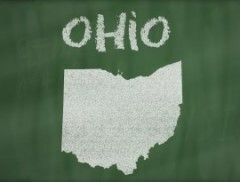 A highly controversial measure to legalize medical and recreational cannabis in Ohio has failed by a wide margin, with almost twice as many locals voting against it as those who cast ballots in favor of the initiative. The proposal promised to give major campaign donors control of cannabis cultivation. That provision split the industry and voters, leading many who would normally support legalization to come out against this particular measure. As of late Tuesday night, the measure was trailing 35.5% to 64.5% with most precincts reporting. The measure’s failure could be a huge loss for the industry at large. ResponsibleOhio, the campaign behind the initiative (called Issue 3), estimated earlier this year that if the measure passed, the legal market in the state could reach up to $2.2 billion in sales by 2020. And while the cultivation side of the industry would have been limited, Issue 2 would’ve created thousands of retail and ancillary business opportunities and tens of thousands of jobs. “When the statehouse refuses to deal with the voters, the voters have to make the deal to make sure their voices are heard, and the only way you can do that is through the petition process,” said ResponsibleOhio Executive Director Ian James in a speech to cheering supporters about half an hour after many mainstream news outlets had called the race as a loss. Still, many industry leaders opposed the measure and felt it would have done more harm than good, both to future legalization efforts and to the Ohio marijuana market in general. Issue 3 may go down in the history books as an initiative that first and foremost seemed to be about money instead of cannabis. The measure would have given about 25 wealthy investors sole ownership of just 10 legal commercial cultivation operations in the state. The structure of Issue 3 also led the state legislature to place its own initiative on the ballot – Issue 2 – in an attempt to undermine legalization. Issue 2 – which was passing late Tuesday night with a slim majority – would prohibit political campaigns from enshrining commercial monopolies, oligopolies and cartels in the state constitution, which is exactly what Issue 3 does. It appeared late Thursday that Issue 2 would pass by a slim margin. Regardless, many observers believe that ResponsibleOhio has changed the marijuana campaign landscape for good by promising a financial windfall to investors who put up at least $36 million for the initiative. And the list of investors – at least, those who have been publicly disclosed – includes plenty of parties from outside Ohio. 9:45 pm: Ohio’s marijuana legalization measure appears to have gone down in flames, with several major news organizations officially calling it a failure. Out of 1.8 million votes tallied so far, 1.2 million are against Issue 3 and just 634,000 are for the measure – an insurmountable gap. About 50% of Ohio’s precincts have reported. The campaign is expected to make a statement any minute. 9:30 pm: The situation remains grim for legalization in Ohio. Issue 3 is still failing 65.5% to 34.5% with over a third of precincts reporting. Issue 2 – which seeks to prevent monopolies like the one many people feel Ohio’s legalization measure would create – is ahead 53% to 47%. 9 pm: Ohio’s marijuana legalization measure appears headed towards failure, according to early results released by the Secretary of State’s office. At just after 9 pm, with nearly 24% of Ohio precincts reporting, Issue 3 was failing by a wide margin, 65.7% to 34.3%. 8:45 pm: Supporters of Issue 3 are slowly trickling into The Joseph at Le Meridien Columbus, a posh hotel just north of downtown where cannabis legalization backers are gathering for ResponsibleOhio’s Election Night party. As of about 8 pm, there were only around 100 attendees, and none of the major financiers of the campaign – such as former boy band member Nick Lachey – had yet put in an appearance. “It’s a pity,” campaign spokeswoman Faith Oltman said of Lachey’s absence. She said she expects around 200 to 250 attendees eventually for the evening. The first wave of election results are expected sometime after 9 pm Eastern. 8:20 pm: In case you haven’t seen it, here’s a picture of the legalization campaign’s controversial mascot, Buddie. In this photo (taken by our own John Schroyer), Buddie is giving a thumbs-up to a passing student at Ohio State University on Tuesday afternoon. Many students stopped to pose for photos with Buddie – though it’s unclear how many of them will actually vote in favor of Issue 3. 8 pm: It appears that election watchers in Ohio and across the nation are in for a bit of a wait. Due to a judge’s ruling that Hamilton County polls must remain open until 9 pm (see entry below), Secretary of State Jon Husted updated his election results site to note that no results will be released until all polls close. So it’ll be at least another hour, and possibly longer, before we get an idea of initial support levels for Issue 3 (and Issue 2, which could sink the legalization measure even if it passes). 7:45 pm: A judge has ruled to allow voting until 9 pm in Hamilton County after ResponsibleOhio filed an injunction requesting the extension. The group said voters in the county, home to Cincinnati, were unfairly turned away from the polls and not allowed to vote. “Any activity, or lack thereof, that leads to voter disenfranchisement should not and will not be tolerated by the people of Ohio,” RsponsibleOhio said in a statement. According to reports, Ohio’s new e-voting system, which had voter registrations saved electronically, wasn’t working. Poll workers didn’t know they had paper backups and turned voters away. 7:10 pm: Michael McGovern, a spokesman for Issue 3, arrived at Ohio State University in Columbus at 6:30 a.m. and planned to stay until the polls close at 7:30 pm. His mission? To get college kids to vote in favor of marijuana legalization. “Have you voted yet?” was his refrain for much of the day at the spacious and sunny quad in the heart of OSU. He got mixed reactions, with some kids affirming that they’d already cast a ballot, and some seemingly indifferent. 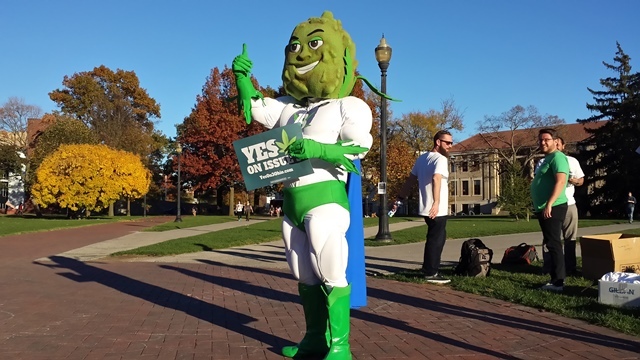 McGovern is also a caretaker of “Buddie” – the controversial mascot that ResponsibleOhio debuted earlier this year in an attempt to engage younger voters. McGovern acknowledged that ResponsibleOhio has taken political flak for a cartoonish-looking icon that seems almost like a marijuana version of Joe Camel. But, he said, at college campuses, Buddie has worked well. 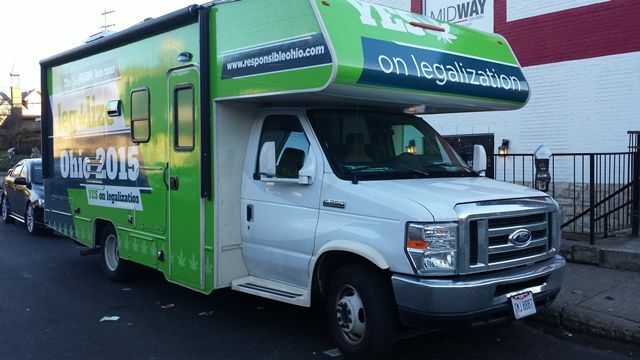 6:30 pm: Here’s a shot of the ResponsibleOhio campaign van (below). Michael McGovern, a spokesman for the campaign, said the van made it to 80 of Ohio’s 85 counties. 6 pm: We’ll get our first insight into whether Issue 3 has a shot at passing in a few short hours. Polls in Ohio close at 7:30 p.m., and the Secretary of State’s office expects to release the first wave of results 15-20 minutes later. There have already been 383,375 absentee ballots cast in the election, according to the Secretary of State’s website, and more than 100,000 that hadn’t been returned as of midday. It could be a while before we know the final results, however. ResponsibleOhio, the campaign behind Issue 3, is attempting to extend voting until 9 pm in Hamilton County, which includes Cincinnati. A campaign spokeswoman said there had been technical problems with the county’s electronic pollbooks, and that the county clerk didn’t have enough provisional ballots on hand to make up for the delay. The result, she said, is that a number of frustrated voters turned around and went home. Major investors who would supply the state’s marijuana market if Issue 3 passes have been fighting back against accusations that the measure would create a marijuana monopoly. “How can you call 10 competing people a monopoly?” Woody Taft told CNN Money, adding that individuals could also grow marijuana for themselves. He called the measure good public policy. Taft and his brother Dudley Jr. are among the two dozen investors who would control 10 cultivation sites if the measure passes. What are the details of the vote? Issue 3 details and final vote results. What are current MC laws on the books. Ohio got it right. Greedy individuals shot themselves in the foot and got what they deserved. if y’all want to be real american farmers? then do it like we do it out here. pesticide management programs, strict protocols on producer processors. S.o.P just like any micro brew or small winery have to do. and most of all embrace your local labs and have your stuff tested. get with the ohio department of AG and show them how washington does it. think about it. what is the best marketing tool you can have on a label? pesticide free, true real deal organic ! we test for arsenic and heavy metls out here !! its all in here!! now get it done folks! if you think you have what it takes to be a real american farmer? In conservative communities starting with medical marijuana is always best. I totally support the industry but I know the moment you say recreational people think random drug use. You have to crawl before you can walk. ( Responsible Ohio)who we would have known. We could have pressured them (RO) to give us the organically grown bud. It’s a sad day for Ohio. The voters realized concentrating cannabis business only in the hands of local oligarchs was antithesis to the ideals of cannabis use in the first place! Next time perhaps the politicians who concocted this scheme will realize even though they already are bought and sold that doesn’t mean their constituents are. The security concerns that are used as the justification for only allowing a few big producers are largely “what if’s” “could’s” and “might’s”; the remotest of possible abuses. Colorado’s seed to sale tracking requirements along with the smaller medical cannabis grows provide superior regulatory control. Patients benefit from the specialization inherent in smaller operations where high cbd low delta9 thc strains can be found. 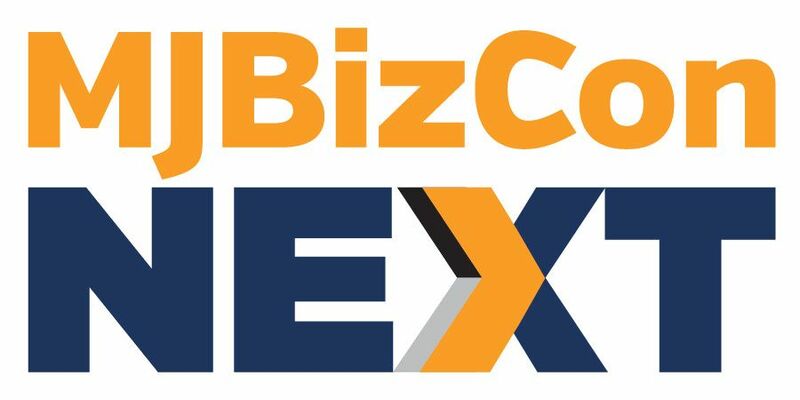 Big Canna will grow what’s popular particularly in the proposed recreational/medical marketplace; that doesn’t necessarily match up with the needs of patients.